LAHORE: (Thursday, November 8, 2018): The Staff Development Orientation and Training Program for newly inducted Assistant Registrars, Assistant Controllers, and Assistant Treasures has been successfully completed by Human Resources Development Center (HRDC) at Institute of Administrative Sciences (IAS), University of the Punjab from November 5th-8th, 2018. 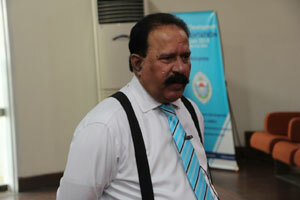 The program was inaugurated by Worthy Vice Chancellor, University of the Punjab - Prof. Dr. Niaz Ahmed Akhtar. He addressed the participants by appreciating them on their merit based appointments. He stressed on adherence to the values of the institution including merit, rule of law, trust and instilled his confidence in leadership abilities of the new appointees. Dr. Niaz applauded the efforts of HRDC under the leadership of Prof Dr. Nasira Jabeen- Director IAS & Dean FEMS to plan and execute the training program. Based on the effectiveness of training programs conducted previously, Dr. Niaz expressed his interest of having similar trainings for other officers working at different tiers of the University. Prof Dr. Nasira Jabeen welcomed the participants to the program and expressed her gratitude to worthy Vice Chancellor, Prof. Dr. Niaz Ahmed Akhtar for his immense support and encouragement towards organizing the program. She shared with course participants that the purpose of the program is not only a formal welcome and orientation but to make participants understand the complex, rich culture and administrative structure of University of the Punjab. The program was a blend of generic as well as specific components including; budgeting in public sector, establishment rules, human resource management skills, financial management rules, gender sensitization, work efficiency strategies and general management skills. It also included stress management and motivational talks that can help the officers in their day to day activities at personal and professional level. The program would serve as an opportunity for mentoring, guidance and networking. 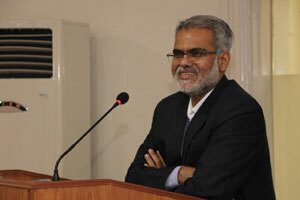 Dr. Jabeen’s address set the norms for the session followed by a brief introduction of participants. Four days of the training included facilitators and speakers from all main administrative offices of the university and renowned trainers and experts of the country. The speakers for orientation program were; Prof. Dr. Mumtaz Anwar – Chairman, Department of Economics – PU, Mr. Qasim Ali Shah - motivational speaker, Dr. Tehseen Zameer Ali – Chief Medical Officer, PU, Mr. Zafar Iqbal Ch. – Resident Auditor PU, Mr. Rao Tahir - Treasurer PU, Mr. Rab Nawaz – Financial and Budgeting consultant, Mr. Rauf Nawaz – Additional Controller Examinations PU, Mr. Anwar Rashid – member Punjab Public Service Commission (PPSC), Mr. Qazi Afaq – member Federal Service Tribunal, Mr. Imran Qureshi- Director IT PU, Ms. Asma Umer – trainer & life coach, Dr. Shahzad Anwar – acupuncturist and pain management consultant, Dr. Aamra Raza – chairperson Department of English PU, Prof. Dr. Muhammad Fakhar-ul-Haq Noori – Principal Oriental College - PU, Dr. Khalid Khan – Registrar PU and Mr. Imtiaz Ahmed – Deputy Registrar Establishment II. The orientation program was a wholesome learning experience for all the participants and equipped them well for official activities. At the closing ceremony, Prof. Dr. Nasira Jabeen – Dean FEMS and Director IAS shared her remarks and gratitude for all the offices of the University that permitted the officers for four day training program and for sharing the valuable information of the relevant offices. She congratulated all the participants upon completing the training and being the alumni of HRDC at University of the Punjab. She advised all the participants to keep seeking guidance and mentoring from the experts of the field by keeping the channels of learning open. Dr. Nasira Jabeen applauded the untiring efforts of IAS administration team for smooth conduct of the program. Dr. Khalid Khan also addressed the participants with appreciation upon their appointment and upon successfully completing the training program. He wished them well for their bright careers ahead. As a token of appreciation, Dr. Khalid Khan – Registrar PU was presented a bouquet by Prof. Jabeen, followed by the distribution of certificates to all the course participants.